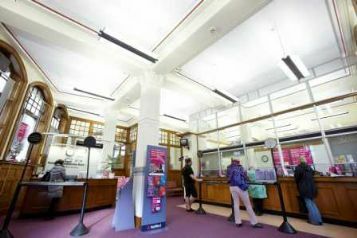 Working alongside our fabric team, our electrical team undertook a refurbishment of the Banking Hall within this Grade II Listed building. 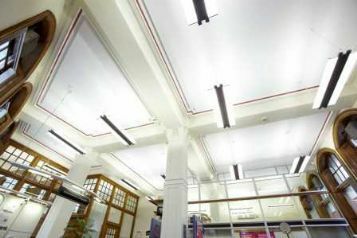 As an integral part of the overall project, we replaced the Banking Hall Lighting and Emergency Lighting. 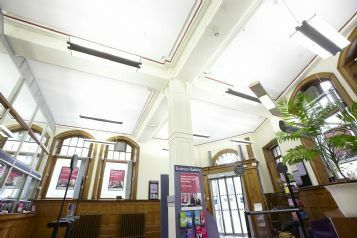 A particular challenge was the high ornate ceiling within the Banking Hall, which restricted the access pointed to secure the light fittings. Our electrical team, working in conjunction with our partnered lighting manufacturers, designed a small range of bespoke fittings. These delivered a lighting scheme which satisfied the Bank’s design and compliance criteria and the local Conservation Officer. As part of the project we replaced the lighting field wiring and installed a new Lumitron Lighting Control System. This allows different lighting settings to accommodate the Bank’s opening hours. 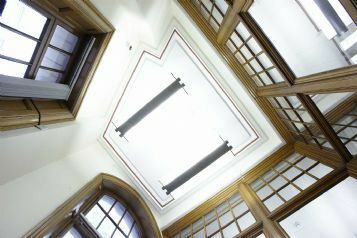 It also works to conserve energy consumption during daylight hours by incorporating daylight sensors into the system with no effect on the Grade II Listed status. Separate Emergency Lighting test key switch facilities were installed for the ease of maintenance, so as not to affect the intelligent control system when carrying out regular emergency lighting testing. To maintain ‘Business as Usual’, our in house electricians worked outside of Banking hours throughout the project, ensuring that the building was fully functional at the start of each working day.